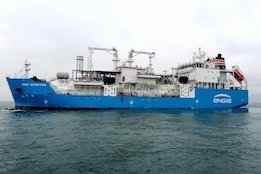 Gas4Sea today announced that its partners ENGIE, Mitsubishi Corporation (Mitsubishi), and Nippon Yusen Kabushiki Kaisha (NYK) have been selected by Statoil ASA (Statoil) to supply liquefied natural gas (LNG) bunkers to four dual-fuel crude shuttle tankers at the Port of Rotterdam. The four vessels, which are to come into service in early 2020, will be supplied with LNG by the ENGIE Zeebrugge. As Ship & Bunker has previously reported, ENGIE Zeebrugge started operations earlier this year and is currently performing regular ship-to-ship LNG bunkering services in the Port of Zeebrugge.